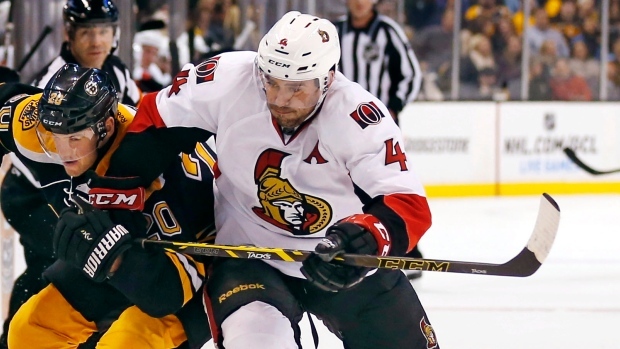 Ottawa Senators veteran defenceman Chris Phillips suffered a major setback in his return to action after having back surgery in April. "Chris has experienced a setback in his recovery from back surgery that will delay his return to the ice," Senators general manager Bryan Murray said in a statement. "While the back surgery earlier this summer has alleviated all of the issues he experienced last season, he suffered a cracked vertebra during his rehabilitation. "Chris will require about a month of additional rehab before he's able to begin training to get back on the ice with the team and will not be a participant in training camp. We do expect him to fully recover and be a big contributor the team's success this season." The 37-year-old told the Ottawa Sun's Bruce Garrioch on Saturday that he suffered a small crack in a disc in his back and there is no timetable for his return to hockey. "It's a significant setback and it's very frustrating," Phillips said. "The surgery went well and everything on that side was great. I don't know if it was a complication of the rehab and I'm not 100 per cent sure how it happened." Senators general manager Bryan Murray told CTV News a return around the mid-point of the season is possible for Phillips. "We hope, we think if he can get healthy certainly the second half of the year, his experience will help," Murray said. Phillips had three assists over 36 games with the Sens in 2014-15, his 17th season in the nation's capital.